Sure, they both starred in multi-film sagas based on popular British fantasy novels. And, yes, they both have blue eyes, slight builds, fair complexions, and floppy hair. (In fact, The A.V. Club once cast them as brothers in the imaginary movie Baby Blues.) 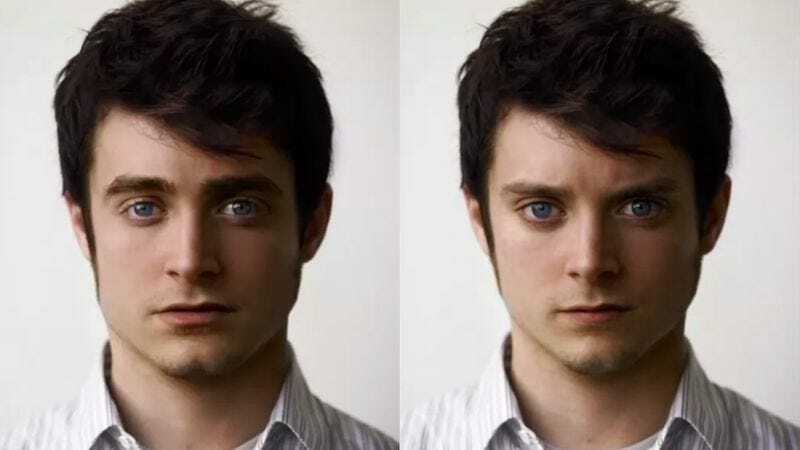 But actors Daniel Radcliffe and Elijah Wood are nevertheless distinct and separate individuals with their own thoughts, ideas, and personalities. Wood, for instance, was born a full eight years earlier and an ocean away from Radcliffe. And at 5-foot-6, Wood positively towers over the 5-foot-5 Radcliffe. How could anyone mix these two up? Nevertheless, some confusion has arisen due to a mesmerizing GIF posted to Reddit recently that morphs the two actors together in a never-ending loop. Here, Radcliffe becomes Wood, who then becomes Radcliffe, who then becomes Wood again. A person could spend hours contemplating this sequence. After a while, the viewer’s breathing might even match the rhythm of the GIF. Breathe in for Radcliffe. Breathe out for Wood. There. Isn’t that soothing? Although this has been Photoshopped so that the two actors have the exact same shirt, neck, and hair, the GIF still points out the subtle yet crucial differences between these actors’ faces. Wood’s eyes are wider than than Radcliffe’s, for instance, but his mouth is considerably smaller. The noses are similar, but perhaps Wood’s is slightly shorter and narrower? The main event here, obviously, is the difference between their eyebrows. Radcliffe’s are bushy, and they form gentle, fuzzy arcs over his pale, guileless eyes. Wood’s eyebrows, on the other hand, are thinner and more angular, and they point dramatically to the bridge of his nose. Both Harry Potter and Frodo Baggins have been through some traumatizing ordeals, but it looks like being a hobbit is even tougher than surviving seven years at Hogwarts.